A pet MRI is pretty much like the type humans have. Magnetic Resonance Imaging (MRI) is the ultimate diagnostic tool. The anatomical detail of the images with the high contrast and tissue resolution achieved with this technology allow vets to diagnose diseases that were once impossible to detect without exploratory surgery. CT scanners and radio-graphs use X-rays while MRI's use radio waves. The technology is therefore less invasive than CT because patients aren't exposed to radiation. 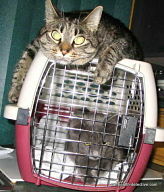 When a cat is positioned inside the MR unit, he's actually being placed inside a large, powerful magnet. The magnetic field generated by this magnet will affect the behavior of the atoms within his body in a particular way. The body is made up primarily of fat and water, which are composed of hydrogen atoms. these atoms contain protons. Imagine the protons as spinning tops all randomly spinning within the body. When the cat is placed in the magnetic field, all of his body's protons spin in a synchronized manner. This spinning creates a low energy field. When more energy such as radio waves are aimed at the cat's protons, the initial low energy of the protons changes to a high energy level. So, the cat is absorbing more energy as radio waves. When the pulse of the radio waves is turned off, the protons will release the energy they have absorbed as radio waves. The pet MRI machine then recovers the radio waves emitted from the protons and uses a computer to turn them into an image to give greater detail than other imaging types. There are advantages to cross sectional anatomy. If a radio-graph of the cat's head is taken, you can only see the skull and the brain remains hidden inside. With CT or animal MRI's, a peek can be taken inside the skull by generating cross sectional images. Imagine a sliced loaf of bread. With all the bread slices together you only see the brown, outer surface (skull) but when you remove one of the slices and look at it without having the other slices or top of the loaf visible, it's like looking at a slice of the brain. The orientation of the view can be adjusted without moving the cat. It a cross sectional slice isn't needed then (like a loaf of bread) it can be sliced along its length and some tumors that are the part of the brain near the neck can still be visible which doesn't happen with CT scans. The animal MRI of the brain will show the different layers of the brain better and can also more accurately differentiate the makeup of brain tumors. With a CT scan the radiologist may see a large mass inside the skull but that same mass done with an MRI may actually show half the mass and the other half is surrounding fluid. Due to this enhanced tissue resolution, an animal MRI of the joints and of the cartilage within the joints is one of the beneficial fields in veterinary medicine. The disadvantage is that although with a pet MRI a lot more is visible, the cost is over double the cost of a CT scan and around 20 times more than a radio-graph. Costs vary so widely nationwide that this is just an example of the differences...not the actual cost. If a radio-graph was $50 then a CT scan would be around $500 and an MRI would be around $1000. You have to prepare for a pet MRI if you decide you can handle the fees or you've wisely obtained pet insurance...you don't simply march into your vet's office and get it done. 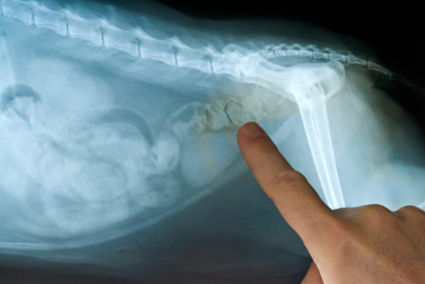 As is typical with any diagnostic technique, deciding whether your cat needs such an exam comes after a thorough vet exam and a consultation with the specialist at the larger institution that will perform the pet MRI. Once a decision is made to proceed there are still lab exams like blood work and perhaps preliminary radio-graphs so that potential problems are eliminated prior to putting your cat under general anesthesia. There are not many centers in the United States that offer pet MRI services and those that do offer the service sometimes have a waiting list but there are a few hospitals with a mobile animal MRI unit on the premises in order to accommodate small animals. The time to scan the brain around 10 years ago was close to two hours but as with any changing technology, these scanning times have been significantly reduced with newer units. You would have to check with the particular facility you choose what their scan time would be. Apart from the low risk of general anesthesia, there’s very little risk from the pet MRI technology itself. Ferro magnetic implants, such as pins from previous fracture repairs and metallic clamps used to prevent bleeding during spaying etc. will degrade the image quality. These metallic objects have no spinning protons and generate a black signal that will distort and obscure the area of interest so your vet may ask about the existence of any such items when considering the exam. 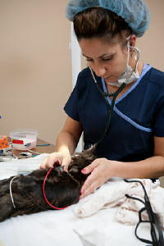 A cat is typically hospitalized for several days prior to a scan so blood and urine samples can be taken. The day before the scan the animal can only drink water and ingest no food. The day of the scan everything is removed from the pet (such as collars). Obviously, many animal MRI patients are critically ill, and the type and amount of pre-scan lab exams and procedures will vary. Finding an pet MRI for your cat isn’t easy but if your vet offers you the option, he will probably refer you to a large veterinary teaching hospital. Most veterinarian offices don’t have animal MRI units because the price is prohibitive for most of them. The cost of owning and running them can be so high that many university teaching hospitals have arranged access to the technology at nearby human hospitals instead of having them onsite so don’t be surprised if your cat’s MRI scan is performed at a local human hospital.